Discussion in 'Video Cards & Monitors' started by Geno, Jan 26, 2013. Hey everyone, for starters I just wanted to say that I've signed up to do product feedback/reviews for Asus products through DanK. Though the above opportunity I've been sent Asus DirectCuII 670 TOP & DirectCuII 660Ti cards to give feedback on. Given I also have another 2x 680's and a 7970 at home I decided it would be a great opportunity to get a 'user review' going, as sometimes I question the bias of some of the larger review sites. I admit I wont be anywhere as thorough as a professional review site - but you can be assured I have no allegiance toward either green or red teams. 1) Which card is the top dog in modern titles with mature drivers. 2) Which card holds the performance vs price crown. Price performance will be measured from the base percentage of the cheapest card (660Ti being 100%) with the others being worked from that. You can see the price percentage from listed cards below. I plan to spend a majority of testing with-in games, as opposed to synthetic benchmarks, to provide a real-world experience an enthusiasts would get with one of the tested graphics cards. 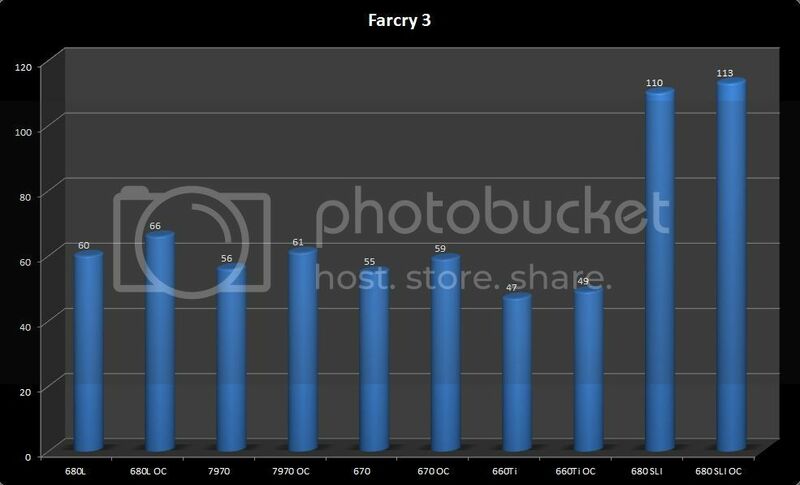 If its a matter of X card beating Y card by 1-2 fps - it should be known that this is a win, but not an overly noticeable one! Enough chit-chat, what cards am I testing?! Cards will be tested on Catalyst 12.11 & 310.90 as they are the most up-to-date drivers available (at the time of writing this). Cards will be tested at standard clocks then overclocked, power consumption will also be monitored. Due to the controversy of over-volting Nvidia cards the review will be done with cards overclocked on stock voltages. I know some might disagree with this decision as you all know I can over-volt the Lightnings with a couple mouse clicks - and same goes with the 7970. But I cannot do the same with the Asus cards as I don't have a hot-wire compatible motherboard. I don't think this should be a big concern as most of these cards can achieve a nice overclock on standard voltage. The phase case will be my test bed, though due to the nature of phase cooling I will be limiting CPU clock to a modest 4.5ghz. I'm doing this as I believe there is a wider amount of 24/7 overclocks in the 4.5ghz region as opposed to 5.0ghz and beyond. Civilization 5 - scrapped due to inconsient results. All cards showing great results here at 1440p, the most surprising of the bunch was the Asus DirectCu II 660Ti Top which proved to stay above 60fps throughout my test. SLI scaling here I found to be really pleasurable yet far from perfect scaling. FC3 with all details cranked up and using HBAO with no MSAA (cant find a jagged edge anywhere at this resolution) the Asus DirectCu II 670 TOP overclocked managed to nip at the heels of a stock 680 Lightning. The 660Ti couldn't manage to get its head above water this time sadly. The cheaper and lower clocked 7970 also performed very well just nudging over 60fps when clocked at 1050/6120mhz. The performance of these modern cards on the latest iteration of Hitman reminded me of Sleeping Dogs, the Glacier 2 graphics engine is really pretty and colourful but really pushed all cards. Everything on this in-game benchmark was maxxed bar MSAA. At the time of writing this i've noticed Nvidia and AMD are/have released BETA drivers to rectify the FPS hit the cards took on tested drivers. Interesting game, probably the least graphically pleasing of the lot, which reflects in the FPS the cards achieved, none-the-less is a new title so decided to test it. I had to disable Vsync via My documents numerous times as it would reset to default vsync enabled upon restarting the game - the graphics menu in-game just screamed, 'IM A CONSOLE PORT'. Complaints aside all graphics cards made mince meat of the game, it has to be noted that for whatever reason the 7970 appeared to show much more detail on players clothes etc, buttons and chains were really bright and just seemed to POP in comparison to all GK104 varients. Not a hell of a lot to be learnt here, the 680 is still clearly king of the synthetic hill. Asus DirectCu II 660Ti Top once again was surprisingly impressive given its price. Note - Both Asus cards for whatever reason were limited to their Base Clocks during furmark stressing. 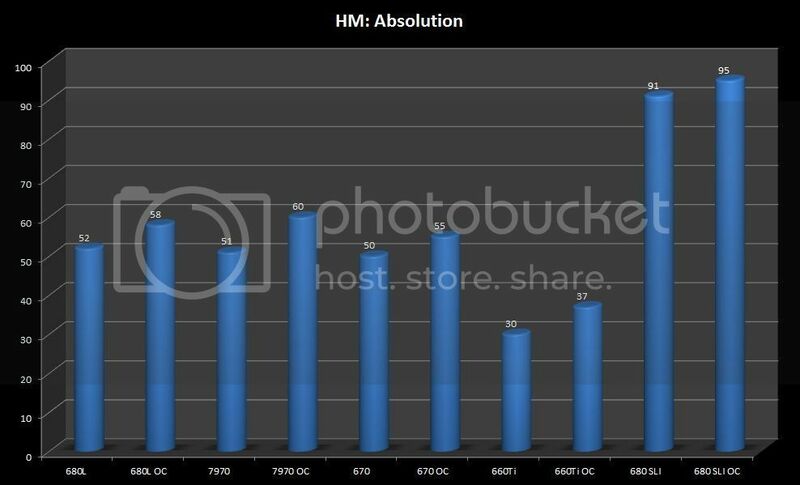 I found the power consumption of the 7970 to be fairly modest compared to what other reviewers have found - was surprised the 680L slurped down so much power. First and foremost I have to say that the Asus DirectCUII 670 TOP's performance when compared to the 680L was a bit of an eye opener, after averaging the total fps then dividing them by the 4 games I tested the 670 was only 4.5 fps away from the Lightning. 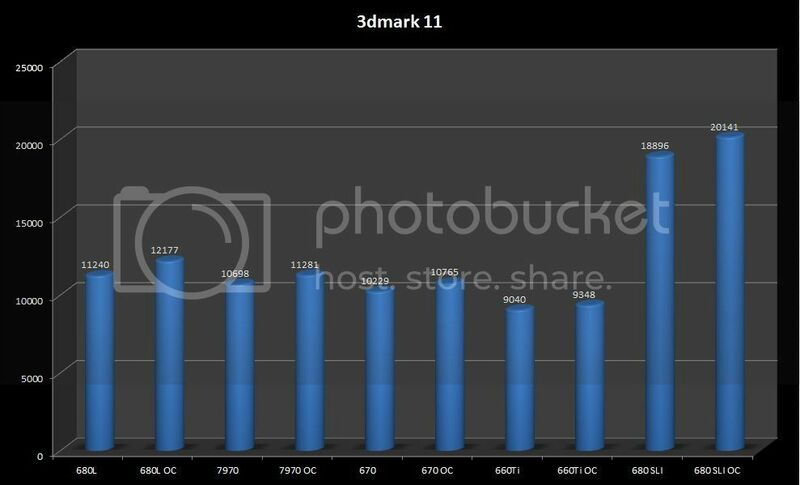 I draw the conclusion that unless the 680L is over-volted and able to reach 1380+mhz game stable its certainly not worth the premium when compared to the 670/7970. 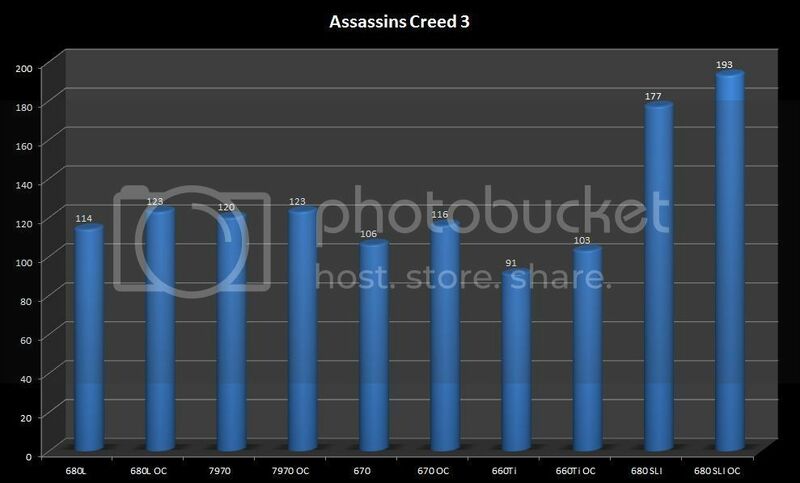 From the averages of the 4 games over all cards its clear the 20% extra frames the 680L gets over the 660Ti doesn't justify the extra 86% in price, no matter how much overclocking is involved. Same can be said for the 7970 and 670 - the 680L is 35% more expensive then both said models but offers far from a 35% jump in performance. So, the questions I wanted to answer and the reason I bothered to do this review have been answered if only through these handful of modern titles. Which card is the top dog in modern titles with mature drivers. 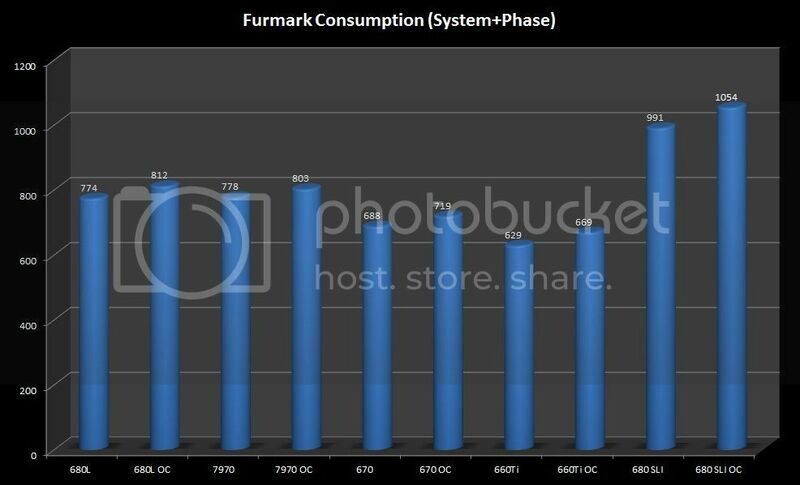 Predictable results, but with the wealth of information out there that forms our buying decisions a 7970 Ghz ed or not doesn't appear to be capable of trumping an over-volt capable 680L. Having said that if you don't have access to buy a good clocking 680L with unlocked bios the 7970 would take this performance king title. I could only ever recommend a 680L over a 7970 if you're a benchmarking queen. The 680L is 35% more expensive then the 7970 but only performs 3.25% better then the cheaper AMD card. Which card holds the performance vs price crown. I didn't realise until completing these tests how badly Lightning owners are paying for their premium product with their OV ability. The Asus 660Ti TOP really shined in this category, its 51% cheaper then the 670 and 7970 while only being 17% less in performance in stock Asus TOP clock profile. 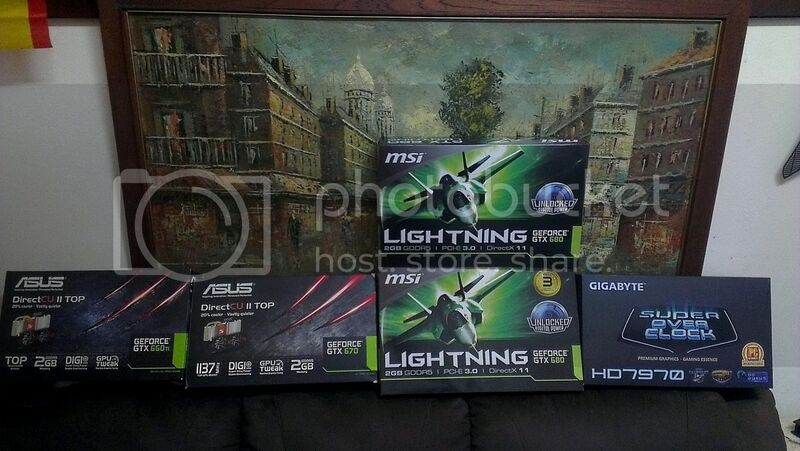 MSI 680 Lightning during overclocked tests was able to achieve 1315/7000 on standard bios. Gigabyte 7970 SOC was able to manage 1150/6120 proving AMD really nailed this generation on clock performance. Asus DirectCUII 670 TOP had a maximum game clock of 1280/7000, Asus have really clocked these high from the box given limited TDP%. Asus DirectCUII 660Ti TOP reached 1220/7000. Special mention goes to the Asus DirectCUII cooler for being almost inaudible. I physically had to look at the fans to know if they were on the 100% fan I set during overclocked benchmarks. The DirectCUII cooler kept both models below the 70 degree threshold in order to stop the cores from down-clocking without the need for a 2.5 slot cooler. So for the decibel concious gamer you cannot go wrong with an Asus GPU. Hope everyone found this as informative as I did! All tests completed on my 680 Lightning(s), will be stripping down to test the Gigabyte 7970 SOC this afternoon. Look forward to seeing what the 7970's 384bit bus will do to the 680 at 1440p! Im jelly mate, was stuck in Perth the whole x-mas holidays! Looking forward to that beer with ya, also when is the next ScotteeeLan? New beast? Im keen to build you/myself an Ivy-e monster with the next gen of graphics cards fosho! Hotwire I didnt realise is completely absent from the models that Asus sent me unfortunately! Test results & conclusion finished! Good work Geno. Cool graphs. Thanks for doing this. That's a pretty thorough review Geno! Cool review, but a bit sad that all the geforce were represented, but only one radeon. 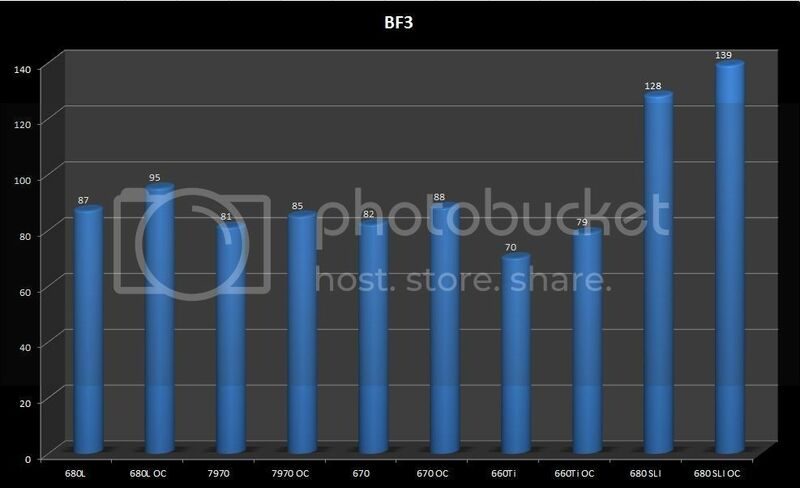 With 7950s going for $295 and stacking up against the 660Ti it could well have been a contender for best bang for buck! Totally agree with the above, mostly did this as the 660/670 were supplied for review/product feedback. I own the 7970 and 680's so decided reviewing 4 models would be more informative then 2. Having said that it wouldn't be hard to incorporate the other AMD models should someone wish to donor theirs for a day or two! I personally would love if my database had all cards in it for this generation, to help educate people from propaganda. Tell me about it... anyone have a donor?! I can shoot you some AMD cards if you want, just let me know which models you would require. Will let you know soon, AMD users are starting to gather around with pitchforks on OCN. I love this bit of e-peen. 2560x1440 is likely to be the new standard among gamers in a couple years but would love to see some tests at 1920x1080 considering it's the current standard. Awesome stuff though, nice work. Haha thanks mate, totally agree. I was taking a page out of a lot of the review sites; some only do 1920x1200 and up. With the way these cheap 27" korean panels are selling I think it might come around a little quicker then a couple years given the push for 4k. Appreciate the kind comments, and hope the review saves some people their well earnt $$!